Most poodle skin problems result from an underlying hereditary illness. After your vet diagnoses the disease causing the skin issues, systemic treatment can begin. Certain poodle skin problems appear primarily in just one of three breed sizes -- toy, miniature and standard, with the latter especially vulnerable to skin disorders. Standard poodles are most likely to develop sebaceous adenitis. A problem chiefly with standard poodles, sebaceous adenitis results from inflamed sebaceous glands. Signs of this skin issue include dry, flaking skin, patchy hair loss, matted hair clumps and general skin thickening. Because it can cause itching, affected poodles might scratch incessantly. Secondary infection is common, so the dog might exhibit foul-smelling lesions. While there is no cure for sebaceous adenitis, symptoms might come and go. Your vet might recommend antibacterial shampoos and prescribe antibiotics to fight infections. Topical oils can offer your dog some relief. Poodles diagnosed with sebaceous adenitis should not be bred. Cushing's disease, common in poodles, occurs when the adrenal glands produce too much cortisone hormones. The disease also can develop in dogs given excessive amounts of steroids over the long term. Middle-aged to older poodles are most often affected. Symptoms include a dull, dry, flaky coat, along with hair loss. The dog's skin bruises easily, and pimples can appear. Any wounds can take considerable time to heal. Poodles with Cushing's disease may exhibit increased drinking and subsequent urination, along with a voracious appetite. A pot belly can develop. 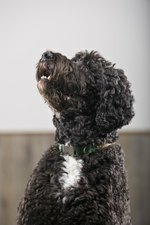 If your poodle is diagnosed with pituitary dependent Cushing's disease, the most common type, he must take medication to control the condition for the rest of his life. If diagnosed with the adrenal dependent form of the disease, that means he has a tumor on his adrenal gland that requires surgical removal. Hypothyroidism, which occurs when the thyroid glands no longer produce sufficient hormone, is common in the breed. Symptoms often include skin problems, especially thickening or changes in pigment, excessive dryness and hair loss. Other symptoms include lethargy, constant hunger and cold intolerance. Fortunately, once diagnosed via a blood test, a daily thyroid pill -- required for life -- takes care of the condition. Pyoderma in poodles usually occurs because of underlying hypothyroidism or Cushing's disease. Pyoderma, or "pus in the skin," consists of three basic types. The surface pyoderma, also known as a "hot spot," causes itching and the affected area usually smells bad. Superficial pyodermas resemble large pimples or boils, while deep pyodermas actually drain pus. Your vet takes a sample of the pyoderma exudate to determine the bacteria involved. While hot spots might respond to topical therapy, superficial and deep pyodermas require oral antibiotics, with the latter type often necessitating a few months of treatment. Your vet likely will prescribe antibacterial shampoos to treat the skin infection.